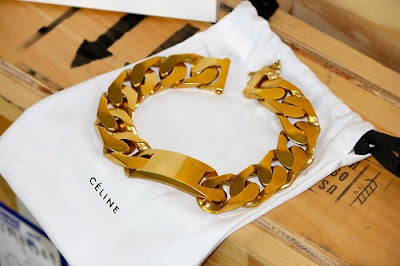 Celine gold ID chain necklace. I've been seeing on fashion editors, trying it on at Barney's and now obsessing over it for the past 6 months! Just my kind of heavy metal. NYC this past July...not sure if they still have it. My name is Marie-Eve Gauthier and I work for Edelman. We really like your blog and would like to talk to you about a visibility opportunity. I would love to explain it further through e-mails. Would it be possible to get your e-mail address? Celine sure knows how to make a beautiful chain!